As far as giving an older game the Source treatment, GhorsHammer's gmDoom port project is probably the quickest to elicit a "Holy %)#@" out of me since Black Mesa. It chainsaws out the UI, enemy, and weapon sprites from the proto-FPS and stitches them into Garry's Mod with astonishing smoothness. I can't imagine how downing a Strider with a blast from the BFG would work, but after seeing it in action in GhorsHammer's video, I can't imagine how it wouldn't work. The mod is undergoing a final round of bug testing and tweaks, and it'll show up in Steam Workshop sometime this week for download. 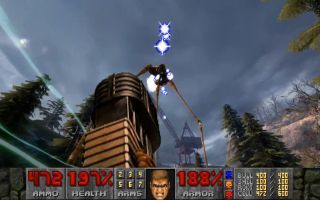 It looks like the Frankensteinian bridge between Doom and Source flows both ways, as you're seemingly able to set up fights against classic hellspawn such as the Cacodemon and Revenant while touting Half-Life 2's arsenal. That includes vehicles, and running over crowds of Imps in Episode Two's muscle car while blasting E1M1 sounds all kinds of awesome.